Result! The green light has been given to a new permissive cycleway on the Roaches Estate in the South West Peak District, north of Leek. The High Forest footpath has been granted permissive cycleway status by Natural England on a 12-month trial basis. This is superb news for mountain bikers in the Staffordshire Moorlands, and a great success for mountain bike advocacy. 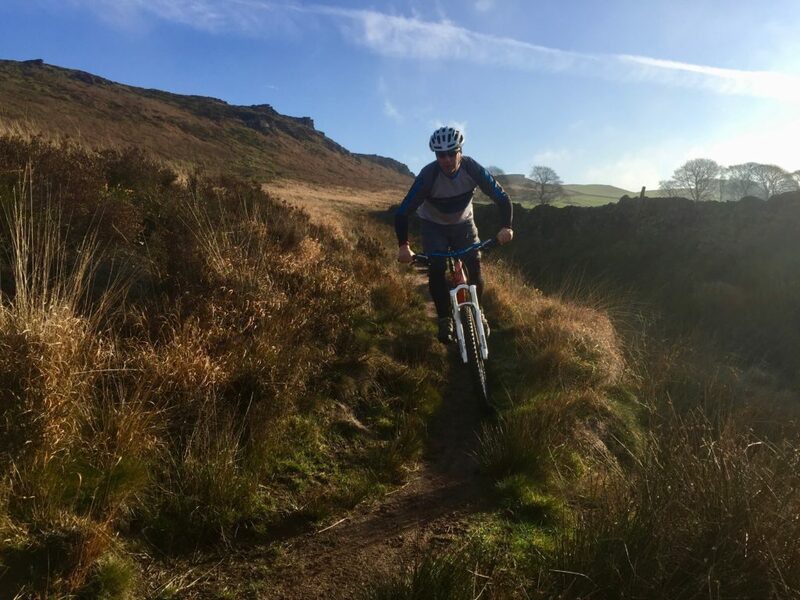 Two years ago Peak District MTB provided Staffordshire Wildlife Trust – land manager of the Roaches Estate – suggestions on how to improve mountain biking in this beautiful corner of the Peak District. Check out our 2017 proposal here. The brand new permissive cycleway connects existing trails to give us mountain bikers much better options to put a local loop together, as well as a fantastic route to the cracking riding around Three Shires Head, Wildboarclough, Macclesfield Forest and even on to Buxton. 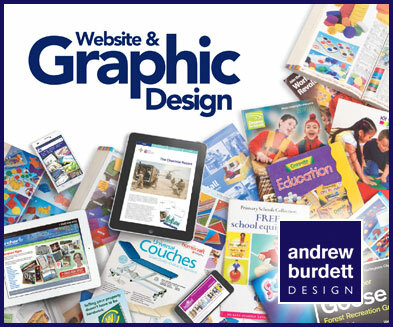 You can make a huge ride out of that lot! Natural England have agreed to a 12-month trial of a permissive cycleway. The upgrade to a cycleway – rather than a bridleway – ultimately made it an easier process, albeit still two years. There is a locked gate on this footpath which means you need to squeeze your bike through a small gap or lift it over the gate. Take the horsepower in your cycling legs, but no horses at this stage. The purpose of the 12-month trial is to satisfy Natural England that cyclists are not making significant additional impact on the path. 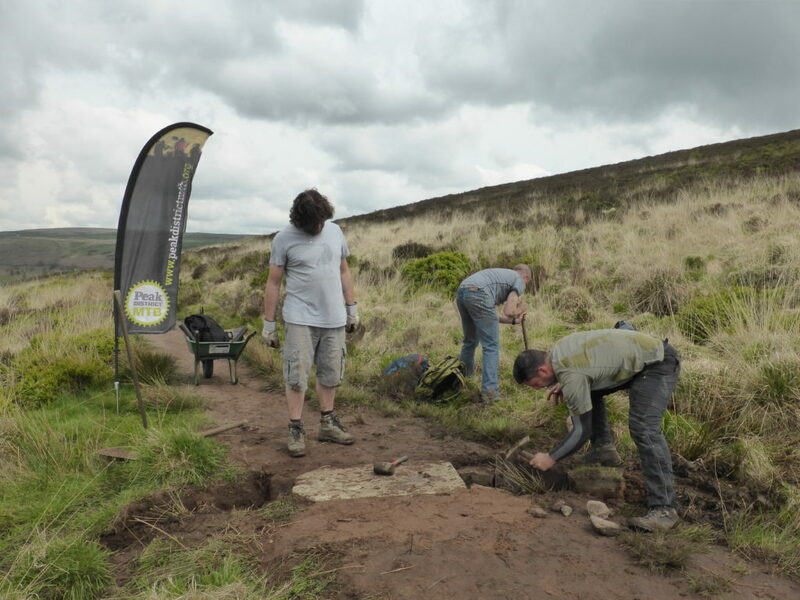 Peak District MTB will be taking regular photos of the identified ‘hot-spots’ to monitor the change in path conditions, and providing volunteers to help with any required maintenance. Let us know if you want to help with this. This is not a purpose-built mountain bike trail. It’s an existing footpath that we felt could be opened up to mountain bikers with minimal changes needed. It’s a lovely bit of flowy singletrack. 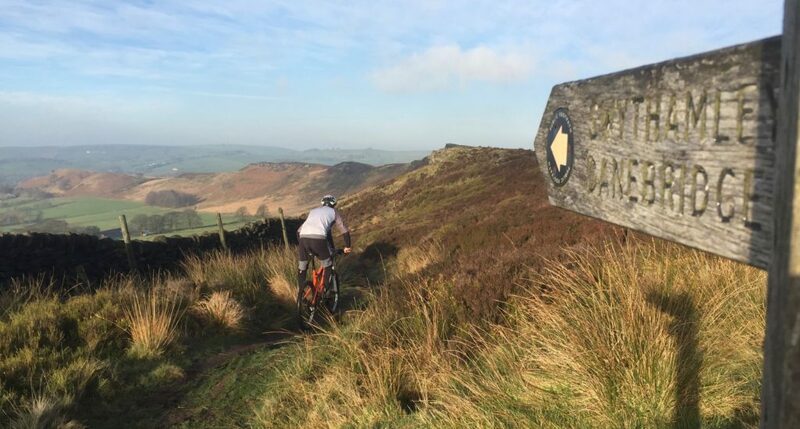 One of Peak District MTB’s core aims is pursuing the opening of new rights of way. We want to make a song and dance about this fantastic news, but there are some practical bits we need to consider. We’re coming into winter. It’s not the ideal time to be opening up a new permissive right of way, since the evidence of mountain bikers will be all too obvious with tyre tracks cutting through the damp sections. I rode it at the weekend and it’s mostly firm and running well, but there are one or two very short sections that are starting to develop their winter dampness. If you ride it, don’t forget to let us and Keeper of the Peak know of the conditions so we can help other riders know if it starts to get very boggy. 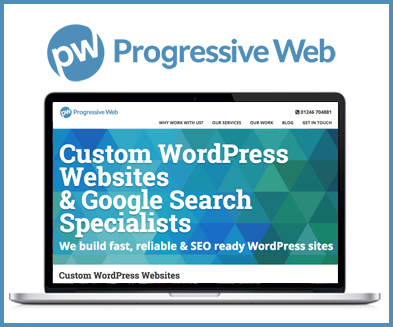 We want to make sure the permissive right of way extends beyond the 12 month trial, which means looking after it. Clearly identifying where it’s OK to ride your bike is also important in reducing conflict with other user groups. We’ll be working with Staffordshire Wildlife Trust to get some suitable signage created as well as having an ‘open day’ to allow us to talk to other users about why this is a positive thing. The maintenance work we’ve been doing with Staffordshire Wildlife Trust will help with this message, since it benefits everyone, not just mountain bikers. In the meantime, if you ride on the new permissive cycleway and meet others, be nice, say hi, do your bit for mountain bike advocacy by explaining what’s going on, and direct people our way if they want more info. 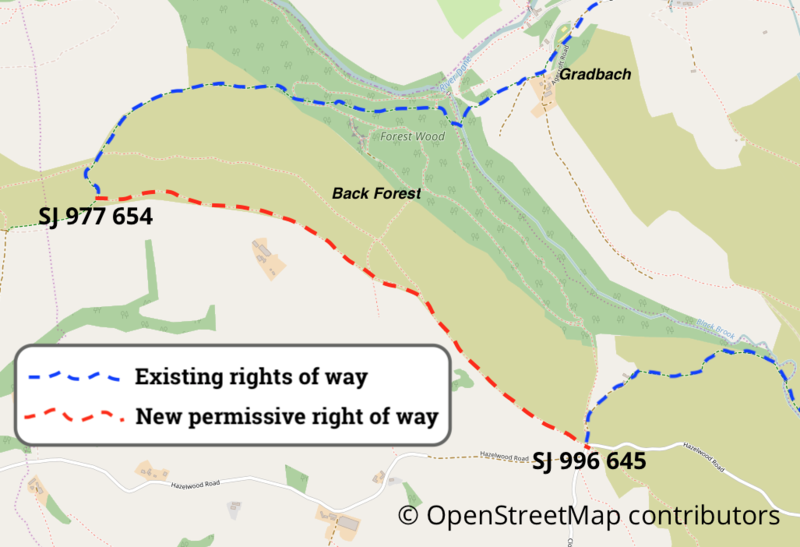 Updated 22nd January 2019 to reflect temporary change to status of nearby rights of way (more info). Now we have a new path we can ride, it’s possible to put a nice little loop together. Here’s a great little route that links the new permissive right of way with the existing bridleway up from Goldstitch Moss and the lovely permissive bridleway down into Gradbach Woods (also available on Viewranger). From Gradbach the route takes quiet lanes to the fantastic rocky trails in and out of Three Shires Head. Stop here for a refreshing dip in the Pannier’s Pool in Summer. Once out of the valley there’s some road work on the main A54, but it’s a freewheel and over quickly. A loose, rocky but short climb up onto Midgeley Hill brings you to a fast and fun double-track descent with great views back towards where you’ve come from. A bit more tarmac on quiet lanes and you (should) find yourself on a farm track that forks back down into Goldstitch Moss – often boggy unfortunately – and a stiff and technical climb back to the start and a welcome ice cream van. Doing it the other way round means the tough final climb is an exhilarating first descent of the day. If you don’t like finishing a ride with a climb, start from Gradbach Car Park. In the Summer months there’s a lovely licensed outdoor cafe at Gradbach Mill for mid/end of ride refreshments. Note that there are a couple of gates on this route that are often locked. You can lift your bike over or wheel it through the narrower pedestrian gates to the side. A big thanks to Jon Rowe at Staffordshire Wildlife Trust who has supported us from day one with our ideas for opening up more of the Roaches for mountain biking. Thanks also to Natural England for giving us the green light, and our volunteers for helping keep the existing Roaches trails in good condition. A special thanks to volunteers Jaime Harper from True North Adventures and Graham Clark, who have been out taking hundreds of photos of the path to help us record and monitor conditions. Enjoy the riding and let us know what you think.